“Brent, that’s history! What does it have to do with this?” asked Viviane. “Well the same principle more or less still applies. The Americans would be reluctant to strike if they knew that a terrorist organisation could detonate a nuke in any of its cities. “But for this standoff to work,” he continued, “the terrorists would first have to prove that they not only have the power of the atom at their disposal but also the willingness, the sheer audacity to actually use these weapons. And the best way to prove this beyond all doubt is to have a small, live demonstration. “But of course you would first need to pick the right target. 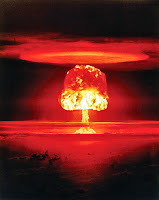 If you nuke California for example, the US will stop at nothing to hunt you down and bomb you back to the Stone Age if you are lucky, no matter what the consequences for America may be. You are also not going to hit somewhere like Timbuktu in the African Sahara because it’s too remote for a demonstration and the world doesn’t have much vested interest in a place like that. “You need to pick a small, juicy and highly visible target -- a tiny nation that after being struck would be too decimated to respond militarily. A small country hosting lots of foreigners and foreign investments so the effects will reverberate across the globe. You need to find one that is a global banking hub so trillions of dollars can be wiped out when the EMPs -- the Electromagnetic Pulse -- radiating out from the blast, fries every computer for kilometres around. “If your intended target is also a major petroleum refining centre -- then that’s going to disrupt global oil supplies for months at least. “Ninety percent of world commerce relies on shipping lanes so if your little glow-in-the-dark, highly irradiated target sits at a major choke point for global shipping -- think of what that would do to the world’s economy. “You need to pick a small country surrounded by large Muslim nations where you can seek refuge after the attack -- preferably one with impenetrable jungle that would bog down even the most advanced army. Given the harsh terrain with many places to hide, explosive religious tensions and the threat of more nuclear reprisals this time directed at major American or Western cities -- all this would make the US or any other country for that matter, think twice about starting another war. In Advent, the extract above discusses why the little island nation of Singapore would be the perfect target for a terrorist organisation to demonstrate its ability to detonate a nuclear weapon. 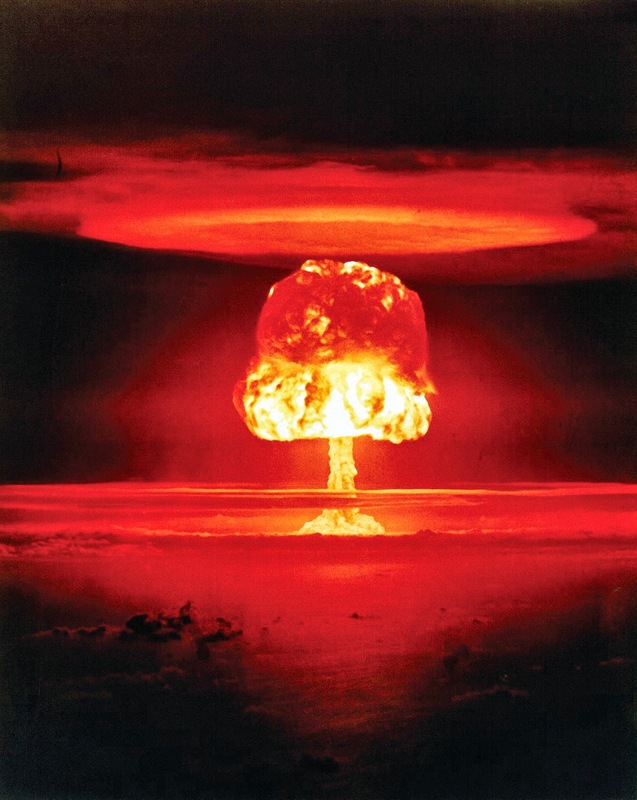 The novel suggests that terrorists are able to secure sufficient plutonium to fashion a crude nuclear implosion-type device similar to that of ‘Fat Man’ – the second atomic bomb dropped on Nagasaki in August 1945. As terrorists are unlikely to have access to a missile or aircraft delivery system, their home-made bomb would be exploded at ground level. In Advent they chose a remote site on reclaimed land close to the Changi Naval Base and Singapore's Changi Airport on the eastern tip of Singapore. 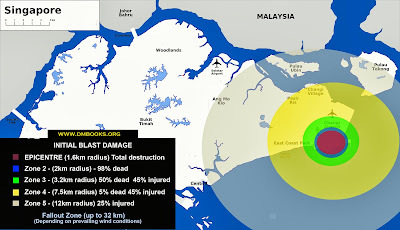 The above map shows the likely extent of the blast assuming an explosive yield of some 27 kilotons of TNT. The immediate kill zone will have a radius of two km (1.25 miles) but injuries and destruction would still be recorded within a radius of 12 km (7.5 miles). Beyond this, the fallout radioactive zone would encompass an area up to 32 km (20 miles) from the point of detonation depending on prevailing weather and wind conditions. This would cover the entire country of Singapore including parts of southern Johore in Malaysia. “Exactly what kind of post-blast destruction are we talking about?” asked the Commissioner. “You are right up to a point,” explained Brent. “Sure the technology of modern buildings has progressed a lot over the years. But that wouldn’t really make a whole lot of difference if you are at Ground Zero when a nuke goes off. “In fact, with our buildings constructed so close together, these tall structures would funnel the blastwave increasing their destructive power and the overall impact will probably be worse. One collapsing building will topple others like a stack of giant dominoes. “If it is a surface detonation, the thermal energy released into the ground from the explosion could trigger a moderate, shallow earthquake. Our buildings here are simply not designed to withstand that. Remember a lot of our buildings are constructed on reclaimed land that for the most part, is soft marine clay and sand. It’s far from being as stable as solid bedrock. So when the ground gives way, those buildings, as strong as they may be, will certainly come crashing down. “A radius of 3.2 kilometres -- that’s enough to destroy half the Central Business District …” interrupted Viviane. “… or an entire satellite town or Changi Airport,” said Gerald. “… or take out any number of military units or our airbases,” said Brent. So what are the chances that a terrorist organisation could explode a nuclear weapon be it in Singapore or elsewhere? In a report published in The Annals of American Academy of Political and Social Science it stated: "The facts bear out a simple conclusion: while the danger should not be exaggerated, a nuclear terrorist attack is potentially within the capabilities of a well-organized and sophisticated terrorist group. A nuclear attack might be one of the most difficult missions a terrorist group could hope to try, but if a highly capable group acquired a stolen nuclear bomb or enough nuclear material to make one, there can be few grounds for confidence that they would be unable to use it." 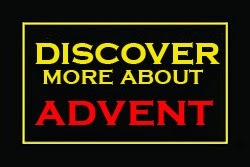 An implosion-type bomb (left) as described in the novel Advent, does not require as extreme a level of sophistication as one may imagine said the AAAPSS. Today substantial unclassified literature is available in libraries and on the Internet along with the underlying physics of materials properties required. It would also not be beyond the capabilities terrorists organisations to lay their hands on substantial quantities of high explosives which would be need to initiate a nuclear chain reaction. An implosion-type device is more technically difficult to construct but as long as a substantial degree of compression is achieved, the timing of the explosive detonations and the resulting shape of the inward traveling shock wave do not have to be absolutely perfect. The physical size of the nuclear material for an implosion bomb can be surprisingly small: six kilograms of weapon-grade plutonium, the amount used in the core of the implosion bomb dropped on Nagasaki, would fit in a soda can. There is, in short, a very real possibility that a technically sophisticated terrorist group, given sufficient effort, could make a crude implosion-type bomb - particularly if they got knowledgeable help, as Al Qaeda has been attempting to do concluded the AAAPSS. The International Atomic Energy Agency has documented 15 confirmed cases of highly-enriched uranium (HEU) or plutonium theft, in addition to other unconfirmed reports. In most of these cases, thieves were attempting to sell the material to the highest bidder. Al-Qaeda has been actively seeking nuclear material, according to some reports, for nearly 20 years. Fortunately there is no evidence that any terrorist group has yet succeeded in acquiring nuclear weapons or materials. U.S. President Barack Obama has called nuclear terrorism "the single most important national security threat that we face". In his first speech to the U.N. Security Council, President Obama said that "Just one nuclear weapon exploded in a city -- be it New York or Moscow, Tokyo or Beijing, London or Paris -- could kill hundreds of thousands of people". It would "destabilize our security, our economies, and our very way of life". Information reported to the International Atomic Energy Agency (IAEA) shows "a persistent problem with the illicit trafficking in nuclear and other radioactive materials, thefts, losses and other unauthorised activities". The IAEA Illicit Nuclear Trafficking Database notes 1,266 incidents reported by 99 countries over the last 12 years, including 18 incidents involving HEU or plutonium trafficking. A study by Belfer Center for Science and International Affairs at Harvard University titled "Securing the Bomb 2010," found that Pakistan's stockpile "faces a greater threat from Islamic extremists seeking nuclear weapons than any other nuclear stockpile on earth."